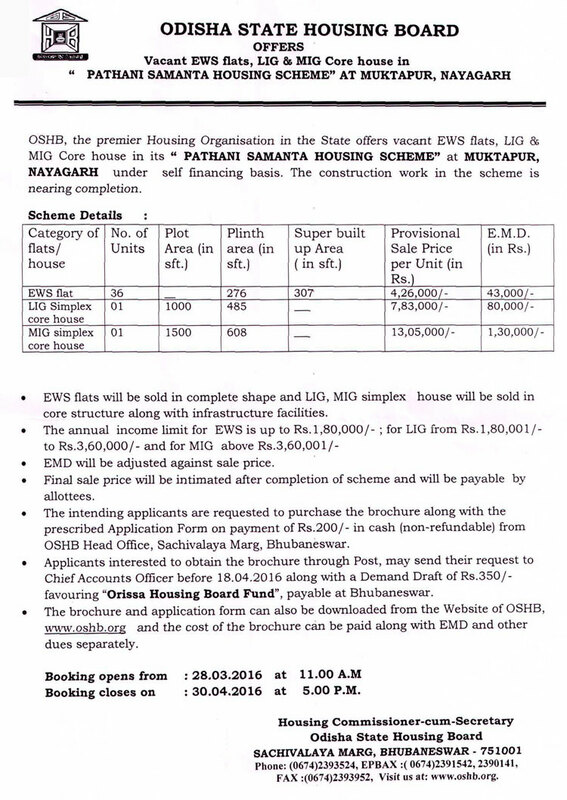 Orissa State Housing Board invites applications for the allotment of flats in Pathani Samanta Housing Scheme at Muktapur, Nayagarh under new housing scheme 2016. In Pathani Samanta Housing Scheme, OSHB has offering 38 flats for economical weaker section, lower income group and medium income group of the society. Flat in the scheme are being offered by the authority on self financing basis. Pathani Samanta Housing Scheme of OSHB comprises of 38 flats of which 36 are available for EWS category and remaining 2 flats are available for LIG and MIG, one for each. Plinth area of EWS flat is around 276 square feet with the super build-up area of 307 square feet. The EWS unit is available at the provision sale price of Rs. 4,26,000/- and the provision sale price for LIG and MIG unit is Rs. 7,83,000/- and Rs. 13,05,000/- respectively. Registrations for the scheme has been started from 28 March 2016 and the last date of application submission is 30 April 2016. Interested applicants can purchase the brochure along with the prescribed Application Form from OSHB Head Office, Sachivalaya Marg, Bhubaneswar by paying Rs. 200/- (non-refundable). It can also be obtained through post by submitting the demand draft of Rs. 350/- in favor of “Orissa Housing Board Fund”, payable at Bhurbaneswar. The brochure and application form can also be downloaded from the official Website of OSHB, www.oshb.org. In case of downloading, the cost of application form to be paid along with EMD and other dues separately. For EWS the annual income is up to Rs. 1,80,000/-. For LIG the annual income should be in between Rs. 1,80,001/- to Rs.3,60,000/-. For MIG the annual income should be more than Rs.3,60,001/-. For more details visit the official website of OSHB.